Recently in the Charleston Attic, in amongst a box full of bold charcoal studies and painted designs, we found a book cover without a book. The hardback has been separated from the papers it once bound together. Either torn off to create an object of its own, or worn away from its pages by years of use, we have only the cover by which to guess about the book itself. “this collaborative work encouraged consideration of the relationship between literature and art. Formerly Virginia had on occasion been slightly repelled by the Bloomsbury painters’ insistence on purely visual qualities. Now suddenly her interest in painting grew stronger; she visited the National Gallery and tried to describe to Vanessa her response in front of certain paintings… In turn Vanessa began to take a more critical interest in books”. 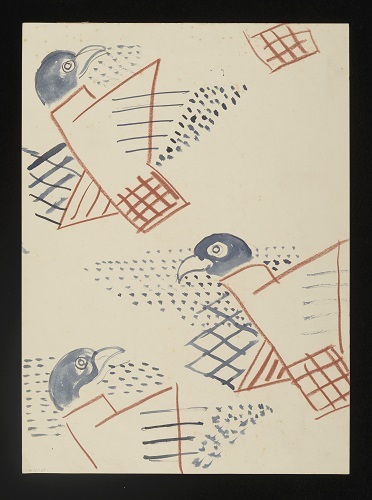 The sisters’ works came together in book design, Vanessa Bell interpreting Virginia Woolf’s words in image, distilling moments from literature in art. 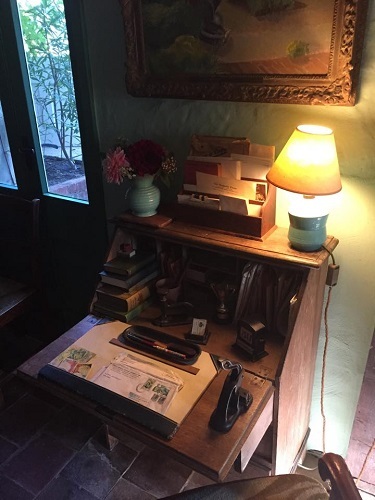 Bell was particularly interested by Woolf’s short fiction, writing to her in July 1917 “why don’t you write more short things […] there is a kind of completeness about a thing like this that is very satisfactory and that you can hardly get in a novel”. The book cover seems to mirror this description. 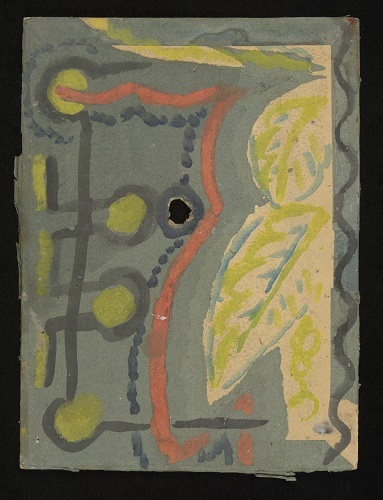 The green leaves on the right transform from glass to feather and back to palm tree leaves only to abstract into the green dots on the left, just as Woolf’s glass “drips on to the marble”. The inside cover depicts a wholly different design of three acrobatic figures underneath a scallop-edged and star-studded hole. This hole is made more obvious here, camouflaged somewhat by the abstract foliage on the front. This led us to ask whether the hole could have provided the means for the young Julian and Quentin Bell to spy on the adults under the pretence of study at Charleston during their lessons in the orchard. A visitor to the Attic also proposed that this could be a gunshot hole, which could very well have been inflicted upon an unsuspecting book in the garden during Julian and Quentin Bell’s childhood experiments with their air gun. However, the cut out hole follows a delicate pencil outline, drawn on the verso side, suggesting this was part of a larger and premeditated design. Indeed, the hole and the verso design suggest an entirely different use for this book cover. Perhaps the cover was not decorated to represent the book that it held but was reclaimed and refashioned into a work of its own. If so, it is similar in style to Quentin Bell’s painted ceramic reliefs and “goggle-boxes” in which figurines adorn plates and can be spied upon through peepholes populating rooms from different eras. 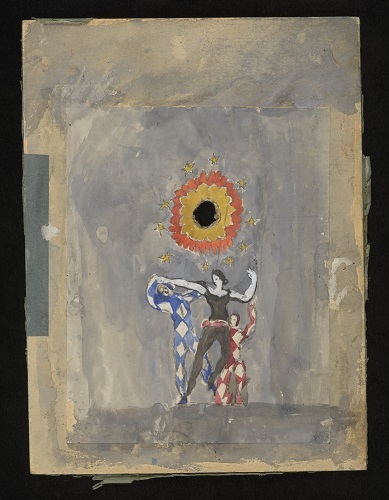 One particular ceramic design, Mademoiselle Zedel, the Human Cannonball, depicts a female performer bursting through a screen held by two male acrobats in matching leotards. Our book cover could perhaps be a precursor to this piece in which the three figures are preparing for Mademoiselle Zedel’s launch that culminates in Bell’s ceramic work. Perhaps she is preparing to fly through the hole in the book cover above their heads. 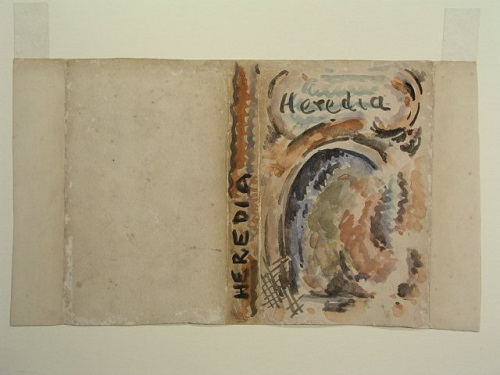 We can imagine the book cover left to one side in Quentin’s ceramic studio before he set out into the house for lunch. Or maybe the work he was doing now had been inspired from studies such as this book cover painted earlier in life. Whatever its purpose and whoever its creator, it fits in very well at Charleston. Its painted cover is like the patterned walls and furniture, inspiring us that any object can provide a canvas. 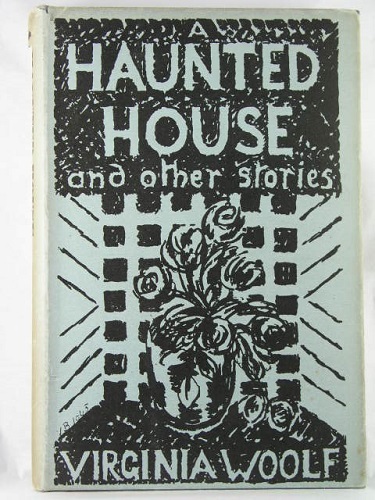 We imagine it blending in very nicely with paintings and other books – perhaps some wearing Quentin Bell’s c.1935 dust jackets – on a table in the studio downstairs. Can art catapult one back to childhood? Woolf’s reading of Alice in Wonderland – written when her niece Angelica Garnett was a newly mature twenty one – responds cheerfully in the affirmative. 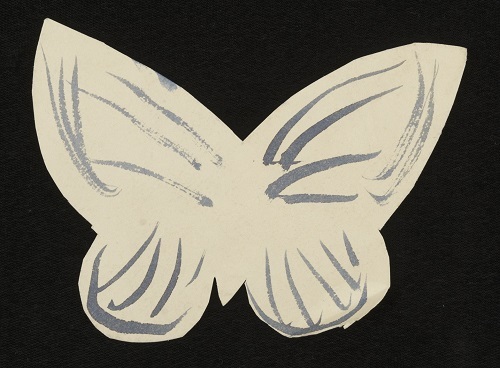 This week in the gift we discovered a collection of childhood drawings by Angelica Garnett; immersed in their whimsical world of elaborately dressed dowagers, fugitive pets and fairy princesses, we too can concur with Woolf’s statement. CHA/P/2279 Recto. Angelica Garnett, drawing, sketch of woman and animals, ink on paper. Photograph © The Charleston Trust. The first stages a triumphant escape by a trio of varyingly domesticated animals: a pig charges forth upon an enormous daisy, followed by two similarly transported dogs. A young woman looks uneasily upon the scene from below, her arm outstretched in appeal. Woolf’s spaniel Pinka frequently visited Charleston during Garnett’s childhood – if not floating on flowers then certainly frolicking amongst them – but such jaunts were necessarily fleeting. Indeed, Garnett’s puzzling little sketch may appear trivial, but it evokes a mood both playful and plaintive strikingly commensurate with her recollection of childhood in Deceived with Kindness (1984). CHA/P/2279 Verso. 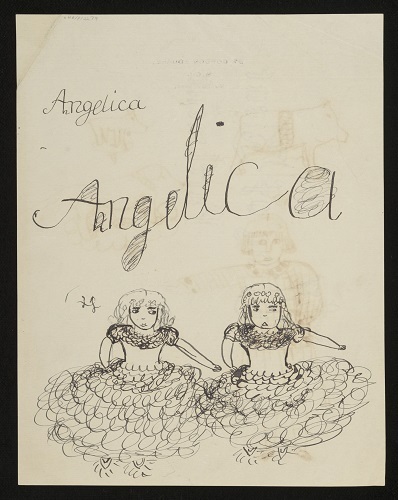 Angelica Garnett, drawing, sketch of two women, ink on paper. Photograph © The Charleston Trust. Overleaf, Garnett’s young woman makes a partial return: her severe bob is suddenly in bejewelled bouclés; her gesture of anguish replicated as an expression of etiquette by two (rather sullen) debutantes in full crinoline. A neat, prim signature is followed by a sprawling, decorative reiteration, only to transform again into a tiny set of initials floating by a woman’s head like a stray sartorial embellishment. Practicing her signature, Garnett might also be understood as rehearsing alternate identities, an experiment with selfhood as provisional and fanciful as her drawings. CHA/P/2281 Recto. 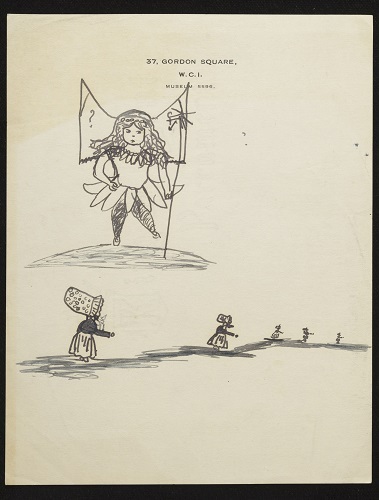 Angelica Garnett, drawing, sketch of fairies, ink on paper. Photograph © The Charleston Trust. The next shows a fairy en pointe holding a star-spangled staff, wearing a shapely bodiced dress and a petal tutu. Garnett’s fairy queen displays a delight in costume styling reminiscent, perhaps, of Duncan Grant’s elaborate ballet designs previously explored on the blog. Beneath her a series of bonneted women scurry into the distance, one arm held aloft; Garnett’s figures become incrementally smaller, until the woman’s form is suggested merely by a collection of inky dots. Here the infant artist does not merely draw for pleasure or identity practice, but sketches as a form of self-schooling, attempting a study of movement and perspective. 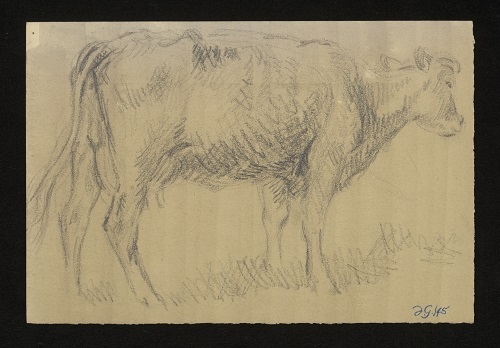 Notable too in Garnett’s drawings is her choice of canvas. Conventional sketch pads are shunned, with Garnett composing instead upon the letter paper of 37 Gordon Square; a location that remains, however, curiously absent from Garnett’s memoir. 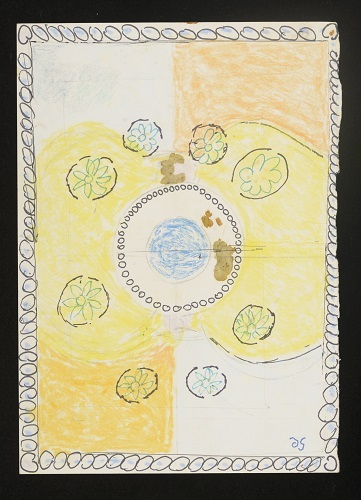 Vanessa Bell moved to number 37 with her four year old daughter in 1922 and remained there until 1929, but it is 46 Gordon Square that Garnett recalls as site of infant artistic experimentation and play. 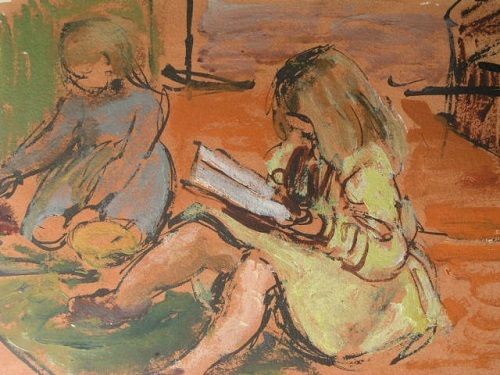 Whether ‘paper-cutting’ chains of ‘ballet dancers’ and ‘exotic flowers’, or receiving a painting lesson from Vanessa (if regrettably, ‘almost the only’ one) Garnett recalls relishing the creative opportunities afforded by living amongst the artists and intellectuals of their London address. And yet, looking again at Garnett’s fantastical sketches, the exclusion of 37 Gordon Square from the realm of autobiographical realism seems rather fitting. A space productive of fantasy must also bear its imprint, remaining concealed from prying, public eyes. 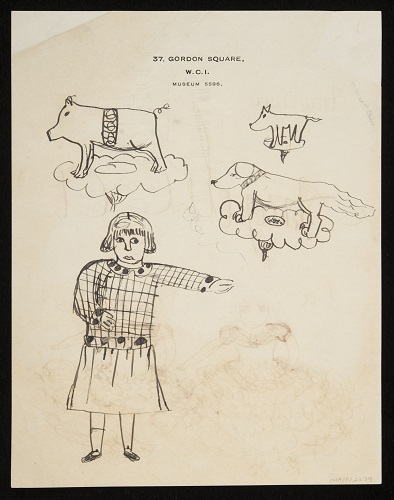 Although composed upon letter paper, Garnett’s drawings are not necessarily seeking a recipient: was Garnett hoping to circulate these images amongst her family and friends as if they were, indeed, dispatches from her interior world, or was she merely visualising its structures and subjects to reinforce its private reality? Garnett’s fantasy world is evidently ‘quite unlike ours’ (as Vanessa Bell remarks of the visions saturating her own childhood) yet it does cast an illuminating light over the art world of Garnett’s infancy. The energy and inventiveness of Garnett’s drawings suggest a home environment where her imaginative life and its expression were encouraged. Fry was, after all, ‘a grandfather with paternal and avuncular overtones’; judging by Garnett’s charming early work, one might assume his benevolent presence moved easily from the affectionate to the artistic. A nascent talent can be seen in full bloom in Garnett’s later paintings. Here Garnett depicts a very different pair of young women: her daughters. CHA/P/53 Angelica Garnett, painting, “Two girls”, circa 1940, ink and gouache on paper. Photograph © The Charleston Trust. 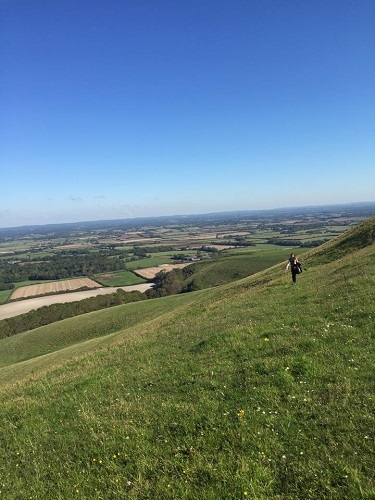 As cool autumnal colours spread across the landscape and misty grey mornings shade the South Downs behind Charleston, we remember our last week with our fellow interns Alice and Samantha. This last week together, the last in September, was bright and warm. 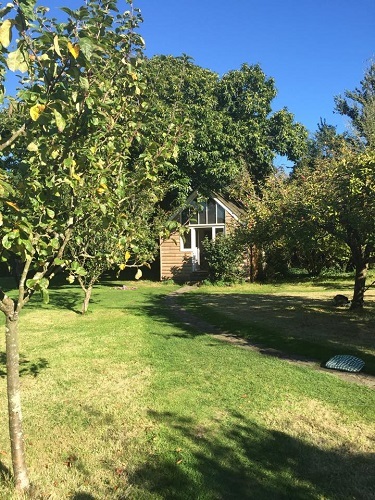 On one glorious morning we strode out from Charleston, taking inspiration from Virginia Woolf, following in her footsteps across the Downs to her seventeenth century cottage Monks House in Rodmell. Having scaled the steep ascent, following our navigator Alice, we looked down upon Charleston as Virginia Woolf would have done, writing to Vanessa Bell in May 1916 “I wish you’d leave Wissett, and take up Charleston”. At that time Vanessa was living with Duncan Grant and David Garnett at Wissett Lodge in Suffolk where the men had been working the farm as conscientious objectors. 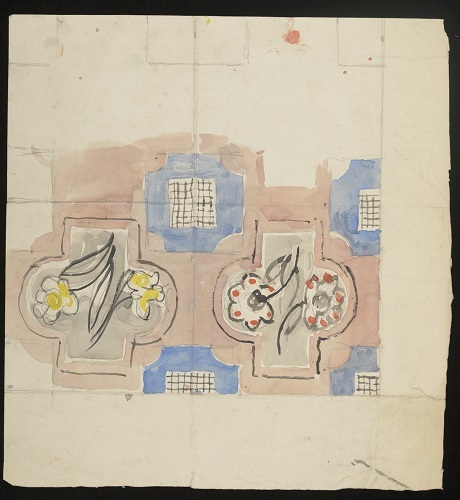 When later that year the Central Tribunal decided that Grant and Garnett could not be self-employed but must find work elsewhere, Vanessa Bell followed up on her sister’s suggestion of a move to Sussex. She secured work for Grant and Garnett with Mr Hecks at the neighbouring New House Farm and obtained permission from Mr Stacey, the tenant of Charleston, to whitewash the walls, creating the blank canvas for the Charleston we know today. This was all in September, and they moved in October, 99 years ago. As we looked down at Charleston from the top of the Downs we too felt excitement, as Vanessa Bell must have done on her first visit, at the prospect of beginning our own chapter at Charleston working with the Angelica Garnett Gift. Our own Becky was chosen from the audience to take on the persona of the “small girl, like a rosebud in pink” whose lines open the play within the novel. Afterwards we made our way back down to the house itself. The Woolfs did not move to Monks House until 1919. Their previous country home in Sussex was at Asheham House, just three miles away in Beddingham, where they and other members of the Bloomsbury group had stayed from 1912. When in March 1919 the Woolfs were given six months notice to leave, they began a search for a new home, resulting in the purchase of Monks House in July. 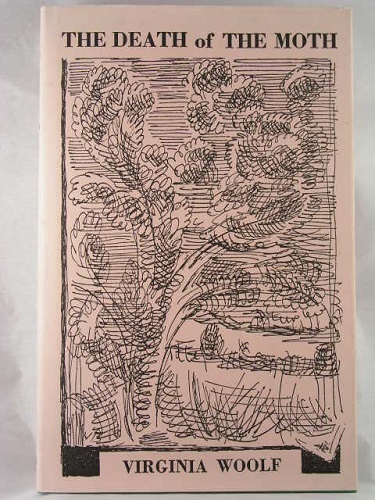 Virginia Woolf records her pleasure at their success at auction in her diary writing “We own Monks House (this is almost the first time I’ve written a name which I hope to write many thousands of times before I’ve done with it) for ever”. 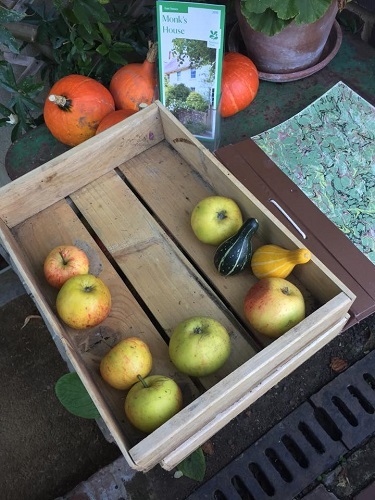 She writes at length about the abundant produce in the garden, which Leonard Woolf seems taken with, and for herself she states “it suits me very well, too, to ramble oft among the Telscombe downs”. On top of the Downs she is swept away in thought. She seems to find a freedom in walking that enables her to release her creativity. Our first forays into the Angelica Garnett Gift have mirrored and even traced the Sussex countryside that surrounds us here at Charleston. 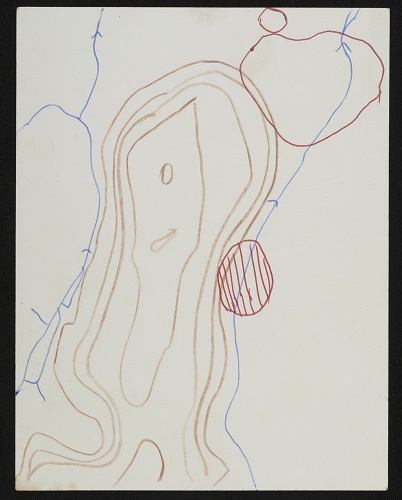 Duncan Grant’s map of the South Downs charts the bold contours of the land. 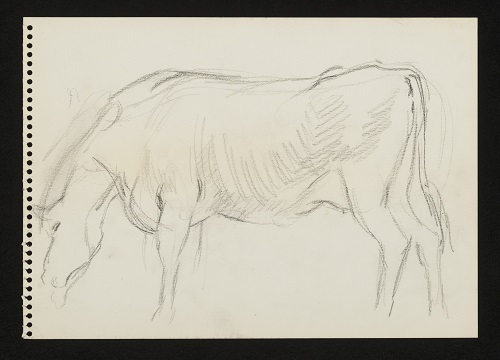 We have found sketches of cows and horses who Woolf may have met on her local rambles. And a small butterfly has also found its way into our box. Pattern design is central to the art of Bloomsbury. From the repeated motifs which can be seen at Charleston to the rugs and linens produced by the Omega Workshops experiments with repeated shapes and bold colours are a common theme in the legacy of the group. As we prepare to hand over the Angelica Garnett Gift into the safe hands of our new attic interns we wanted to share some of the beautiful designs that have been found in the Gift to date. Just as Charleston was transformed and evolved over the years with the artists decorating surfaces with patterns and designs so must the Angelica Garnett Gift. We wish the new interns the best of luck with their work and hope you enjoy reading about their discoveries and research.